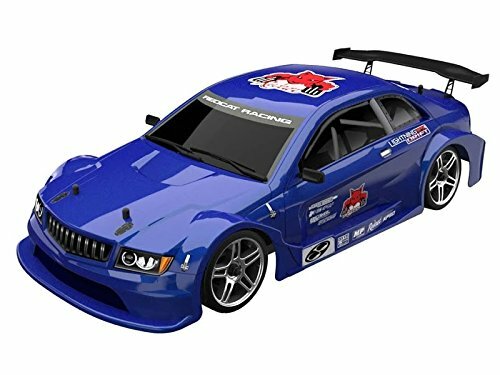 If you’ve been searching for RC cars, you may have come across some of the drift car options that are available. There aren’t as many RC drift car toys which can make it difficult trying to find them. That’s why we’ve researched and reviewed what the best ones have to offer. Remote control drift cars allow kids to perform a wider range of stunts that can’t be achieved with the regular ones. So, if you’re looking for something to challenge your children and keep them entertained, you’ll want to check out our reviews below. A buyers guide section is also available at the end to provide you with additional information that can be useful for helping you to feel more confident about making a decision. We were impressed with the design of this drift car because of how they have used polycarbonate materials to make it. This provides it with a fantastic race car appearance that kids have been loving. In addition to this, we liked how they have implemented aluminum capped oil filled shocks. These work effectively to provide the car toy with plenty of stability while going across different surfaces. The 2.4Ghz radio controller ensures that your little one is able to have complete control over the car. This is a result of the frequency which minimizes interference. Kids also have the freedom to control the car however they like. 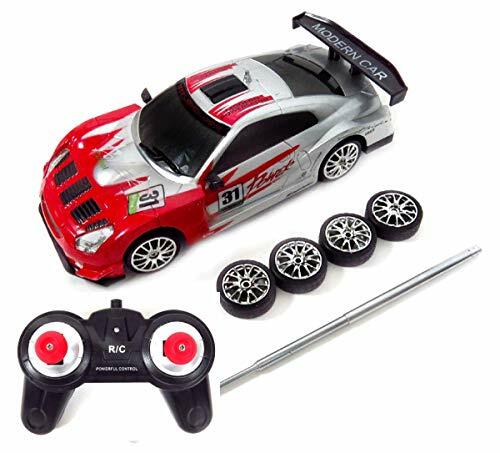 The aluminum capped oil filled shocks are excellent for ensuring that kids can have control over this drift car when going across different surfaces. This Jada Toys Fast & Furious Brian’s Nissan Skyline GT-R is a fantastic choice for kids who are fans of the film. They have designed it to look just like the one from the movies, which kids have been loving. It enables them to use it to play in more imaginative ways by recreating their favorite scenes. We also liked how the remote that’s included has a pistol grip. This makes it more comfortable to hold and allows kids to perform different stunts easier. There’s a drifting action available which works incredibly well. In addition to this, they’ve included a turbo button which lets kids experience higher speeds to have a blast. Parents have been liking how this one is easy to charge due to the USB cable. We liked how the design of this drift car inspires kids to play creatively. They’ve also been loving how they can drift with precision because of the pistol grip remote. 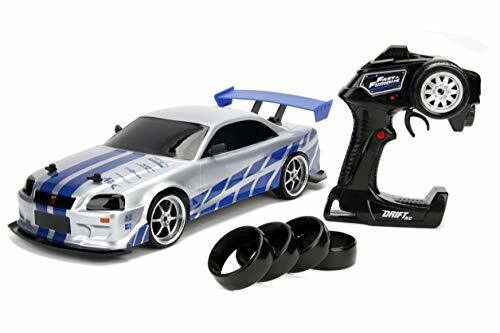 If your little one is looking to play with a stunt car that can perform a range of tricks, this drift car by USA Toyz would be a great choice. It has tilting tires that allow it to go across surfaces smoothly which allows for total control. The rechargeable batteries are awesome for allowing kids to play continuously for a while before it needs recharging. This feature makes recharging an absolute breeze, which parents have been appreciating. 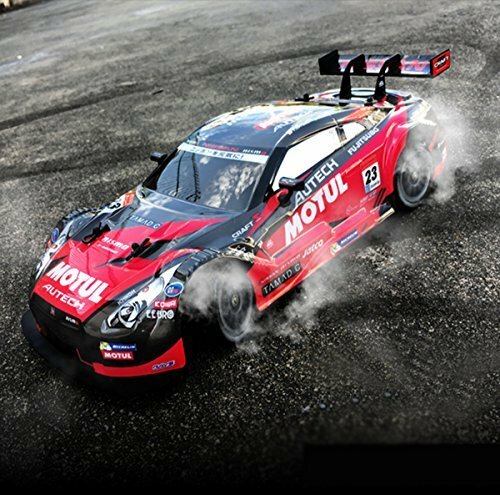 We were impressed with how this RC drift car is able to perform 360-degree stuns and pop wheelies! You can be sure that these stunt features will keep your kids entertained for a while. The 4 tilting tires are what allow kids to experiment with the wheelies and 360-degree spins to have a blast for hours. The RC car is able to reach an impressive speed of up to 18 km/h! This provides your children with plenty of power to have fun with for years to come. There’s a 360-degree rotating feature available too. This enables kids to perform some incredibly entertaining stunts. As a result of the 2.4Ghz remote that’s available, kids have precise control over the car toy too. This is because the frequency reduces any interference. With a 4-wheel drive feature built-in, you can be sure that your children are provided with even more control. We also liked how it can last for up to 30 minutes of continuous play after being fully charged. The 4-wheel drive, 360-degree spinning feature, and 18 km/h top speed provides kids with everything they need to carry out a range of stunts while having total control. We liked how this Redcat Racing RC car is powered by an electric motor as it’s super convenient to charge. In addition to this, a 4-wheel drive function has been fitted too. This is great for ensuring that your little one is able to control the car with ease. Moreover, a 2.4Ghz remote has been included which is incredibly responsive and allows kids to control the toy without any interference. Not to mention, oil filled shocks are included. These are fantastic for keeping the toy car steady when it’s going across different surfaces. Children have also been happy with the design of this one. With the 4-wheel drive and oil filled shocks, kids can perform different stunts with this one without it spinning out of control. The 380 brushed motor that has been fitted in this RC car enables kids to take it to a top speed of 20 mph! So, kids are able to play around with a lot of speed to keep themselves occupied for a while. We also liked how there’s a 4-wheel drive and independent suspension system available. These work effectively to provide the toy car with a lot of stability while going across different surfaces. With a high-quality chassis and film over the body, you can be sure that this car is durable. So, your little one can play with it both indoors and outdoors for years to come without it being prone to damaging easily. Though not as fast as some of the fastest RC cars we reviewed the 20 mph speed is more than enough for kids can have an absolute blast playing with this car. This drift car comes with awesome lights on the front, back, and sides. Kids have been loving these lights as it allows them to play with the toy in the dark, which is a different experience. These lights are exciting and stimulate your child’s visual learning senses. It comes with a fantastic remote control that’s responsive and lets kids control their toy car with plenty of precision. They can use it to perform incredibly fun 8 and U-shape drifts. With the 4 rubber tires that have been fitted, the car is provided with plenty of traction against the ground, which is what enables kids to carry out stunts. Kids love being able to perform different drifts while having precise control and having the opportunity to use the toy in the dark due to the lights. Parents have been glad to find the the CARISMA RC Touring Car comes in a ready to run state. This means you can simply take it out of the box and it’s ready to play with. Charging the battery is also a breeze. Kids have been noticing how the design that has been used with this one is incredibly detailed. This provides the toy car with a fantastic visual appeal that makes it more fun for your little one to play with. 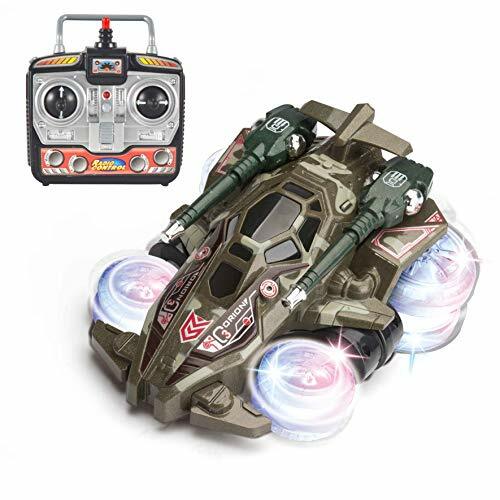 The radio control that’s included allows your child to have total control over the toy car. So, they’re able to perform a range of different stunts with ease. There is also a range of upgrade parts available to customize it over time. People have been having a blast with this one! We were impressed with the detailed design of this one as it makes the playing experience more exciting for kids. The 2.4Ghz remote that’s available with this toy is super responsive and prevents any interference. Therefore, your little one is provided with plenty of control to perform a range of stunts. They can use it to drift in figures of 8 and U-shapes, which they have an absolute blast with. There are 4 high-quality tires that provide the toy car with plenty of grip against the surface to carry out drifts without any hassle. We also liked how it takes around 90 minutes to fully charge. This leaves your children to play with it for up to 15 minutes of continuous play. The design of this one also makes it look like a real car, which kids have been loving. With the responsive control and high grade tires, kids are able to perform a range of drifts to have a ton of fun. 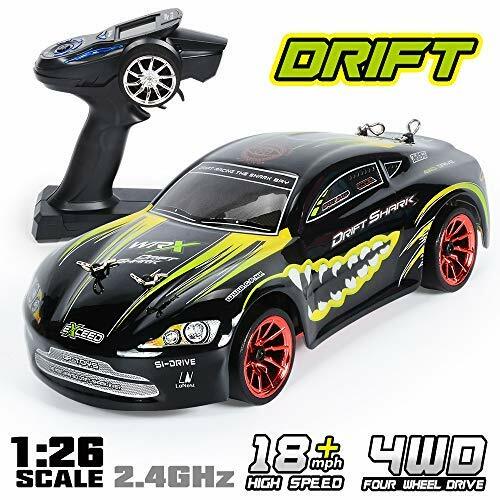 This NQD Racing Drift Car comes with a powerful motor that enables kids to take it up to speeds of 25 km/h! This is plenty of speed to allow your little one to have a lot of fun. It comes with 2.4Ghz radio system which provides your little one with plenty of precise control over the toy car. As a result, they can perform stunts without any frequency interference. Charging this one is also super convenient. This is because it comes with a USB cable which you can simply plug in and leave to fully charge for 3 hours. After being fully charged, it can last continuously for up to 15 minutes. 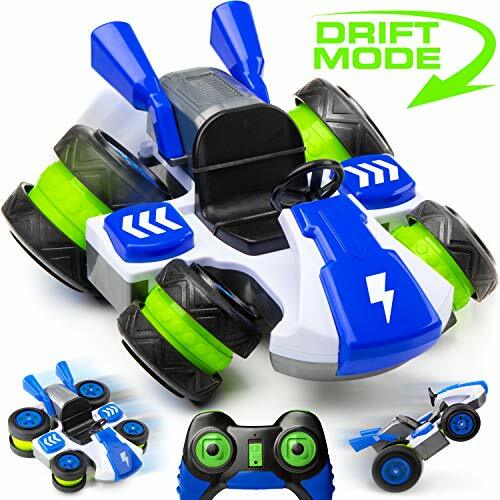 The top speed of 25 km/h allows kids to have a ton of fun racing this toy car and making it perform incredibly fun drifts for a long time to come. 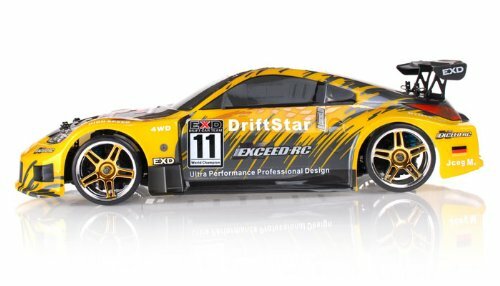 Liberty Imports’ RC Racing Car comes with 4 high-quality rubber tires. These are awesome for proving the toy car with plenty of traction to allow kids to make it drift with precision. The remote that has been included is incredibly responsive too. Therefore, kids can perform figure of 8’s and U-shape drifts, which are a ton of fun. The high speed of this one mean that kids can challenge themselves with the drifts. We were also impressed with how they’ve included lights on the sides, back, and front. This means that your little one can use the toy in the dark to have a unique playing experience. It’s also excellent for their visual learning skills. The responsive controls and high-quality rubber tires are what allows kids to try out different drifts and have a blast. 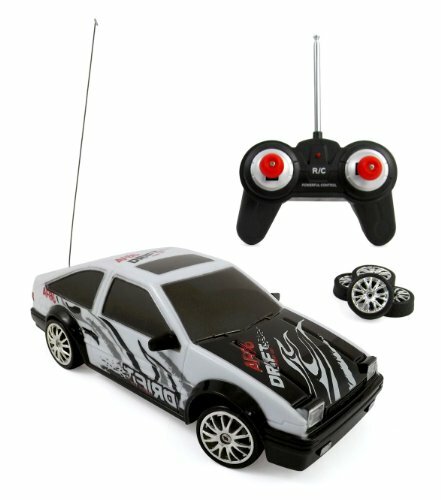 The PowerTRC RC car comes with an awesome remote that has a grip that’s comfortable for kids to hold onto. This allows your little one to have total control over the toy car. This ability to control is with precision is what enables kids to perform U-shape and figure of 8 drifts. They can challenge themselves by taking the car to higher speeds. We also liked how there are 4 high grade rubber tires available. These provide the toy with a lot of traction to let kids have control over it. There are also lights available on the front, back, and sides. These are great for making the playing experience more exciting while also improving your child’s visual learning senses. With responsive controls and high-quality rubber tires, kids are able to perform a variety of drifts. They’ve also been loving the lights as it lets them play with the toy in the dark. 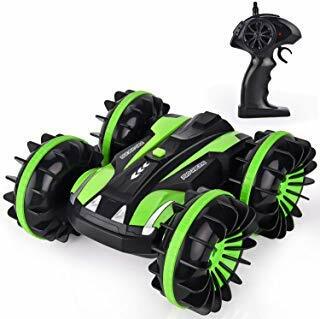 JOYIN’s Armor Drift Acrobatic Stunt RC Car comes with a fantastic remote that provides your little one with plenty of control. As a result, they’re able to make it perform incredible drifts and 360-degree spins. We also liked how using the remote is a fun way for your child to develop their motor skills and hand-eye coordination. Moreover, due to the design of this toy car, kids love using it in their pretend play games. Therefore, it’s excellent for improving their creative thinking skills. The wheels that have been fitted are also of a high-quality to help kids perform a wider range of stuns. Children have been loving how they can perform drifts and 360-degree spins while using this toy car. We liked how this RC Stunt Car can be used on a wide range of surfaces that vary from gravel, sand, grass, and even snow. This provides kids with the chance to play with it in different weather conditions. It has a rubber ring underneath which keeps the electronics on the inside safe from being damaged. It can also be used to perform stunts and 360-degree spins, which children have been having a ton of fun with. In addition to this, it has been fitted with a 4-wheel drive function which provides it with a lot of traction on all kinds of terrain. We were also impressed with how it can travel at up to 15 km/h as it’s plenty of speed for your little one to have fun with. This toy car can be used to perform drifts and stunts on all kinds of terrain, which is a lot of fun for children. The MadSpeed Drift King has been fitted with a brushless motor that provides it with a lot of power for kids to have a blast with. This allows your little one to perform drifts at higher speeds, which is more challenging. We liked how the remote that has been included is easy to get to grips with. It’s also very responsive which enables children to have total control over their toy car. In addition to this, there are awesome lights available. They can be see on the front, back, and sides of the toy car. These make it more exciting to play with, especially in the dark. Furthermore, the lights stimulate your child’s visual learning senses. The lights available on this toy car let kids play with it in the dark, which is a fun experience that also improves their visual learning skills. This is another Exceed RC Drift Car that has been fitted with a fantastic 4-wheel drive system. It works effectively to provide the toy car with plenty of stability while going across different surfaces. We found this to be a great feature for beginners as it grants them more control over the toy car. As a result, they’re able to perform drifts without any hassle. The remote is also incredibly responsive. While using the controls, your little one’s motor skills and hand-eye coordination are provided with a fantastic opportunity to develop. Moreover, they’ve used aluminum materials which keeps the toy durable. 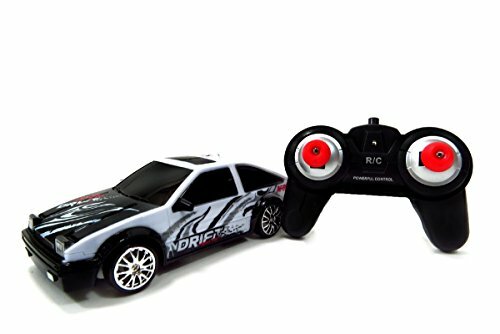 The 4-wheel drives and easy-to-use remote makes this one easier for beginners to use and practice drifting with. 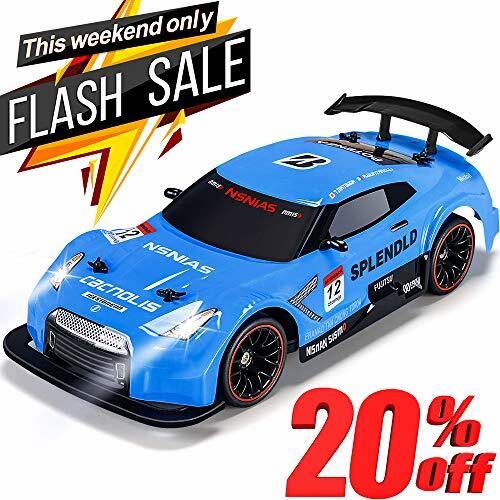 Now that you have a better understanding of what some of the top RC drift car toys for kids have to offer, you can begin to narrow down your search to find the perfect one for your child. However, if you’re still feeling a little unsure of which one to pick, don’t worry. We’ve created this buyers guide section to provide you with some additional information that could come in handy. 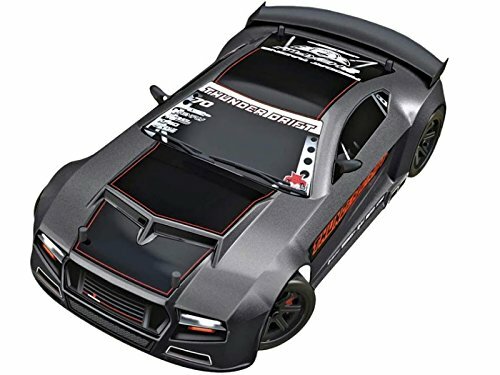 After reading through this review, and doing any research of your own, you will have seen that there are a few different kinds of RC drift cars available. If you were interested to learn a little more about these various types, take a look below. The stunt cars are awesome for kids who want to be able to perform drifts, as well as a range of other stunts. These types of toys enable your little one to perform drifts, as well as 360-degree spins. There are some RC drift cars that allow children to use them on all kinds of terrain. This can vary from grass, mud, gravel, pavement, sand, and snow. We recommend these ones if you want to encourage your little on to be a little more adventurous with how they play. Most of the toy cars in our review have been made with a race car design. This is because children love using them to drift around and feel like they’re driving a real race car. These designs can make the experience more exciting. 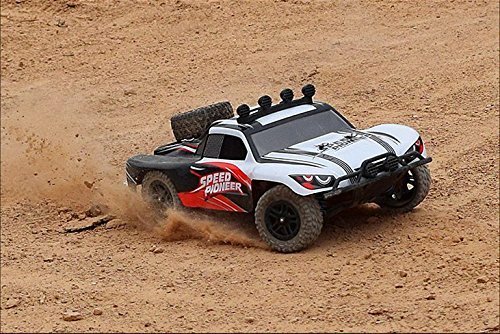 Nitro gas cars and trucks are some of the fastest RC cars on the market so if your child is very experience in playing with RC cars then a Nitro gas drift car would be a great option. There are a number of fantastic brands that manufacture drift RC cars, and many of them have been mentioned in our review. If you were interested to learn a little more about these brands, take a quick look below. Joyin was established in 2015 and has climbed their way up to becoming a brand that parents trust when it comes to finding toys for their kids. They now have more than 800 different products available with new ones releasing all the time. Their RC cars are made with high-quality materials and enable kids to have fun with them for years. 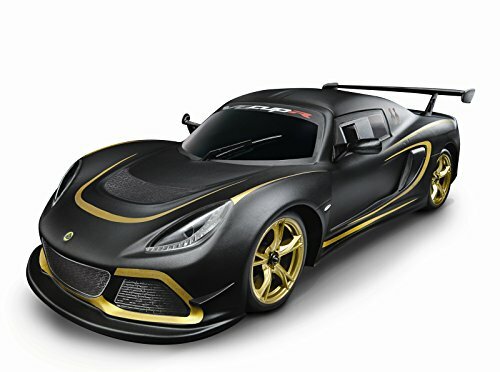 GPTOYS is another excellent brand that focuses on manufacturing hobby items that include RC toys. These items are awesome for adults and kids to have fun with. As a result, they can make for some quality bonding time between you and your little one whether it be driving a car or flying an RC plane or helicopter. We also liked how they put all of their products through strict procedures to ensure that they are of a high standard. Jada Toys is a well known brand that has gained a great reputation for making RC toy vehicles that kids have been loving. This is because they work alongside vehicle brands to create innovative toys that children have a lot of fun with. They’ve gone a step further by making toys that have an incredible attention to detail. This makes their RC car toys look super realistic, which adds to the playing experience for kids. USA Toyz started out back in 2012 where they had the goal of creating toys that kids could have fun with. They were a smaller family owned business that has now made a name for themselves when it comes to children’s toys. Girls tend to enjoy all types of RC cars but typically want ones in girly colors such as pink or purple so the options listed in this post might not be the best for them. 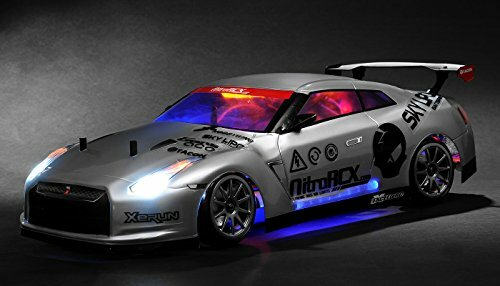 RC drift car kits can be a fun way for you and your little one to spend some time together. This is because these kits require you to build you toy car before you can start playing with it. So, you and your kids can get together and go through the steps to build your very own remote control drift car. It’s a fantastic way for your child to learn how to follow instructions and stimulate their problem-solving abilities. Since it involves a hands-on approach, your child will be able to develop their motor skills and hand-eye coordination too. Using drift car kids can be a remarkably rewarding experience that makes the toy even more fun to play with. So, that brings our review for the top RC drift cars to an end. Be sure to read through the main features, pros, cons, age recommendations, and what makes each option stand out. That will provide you with the best idea of which one you think your little one will enjoy the most. The age recommendations are important to ensure that you find an RC drift car that’s appropriate for your child. Picking one that’s meant for an older child could make it more difficult for your little one to get the hang of it, which could be frustrating. These toys provide kids with a unique way of playing that they don’t get with regular RC cars. Hopefully, all of the information that you need to feel confident about making a final decision can be found in this post!